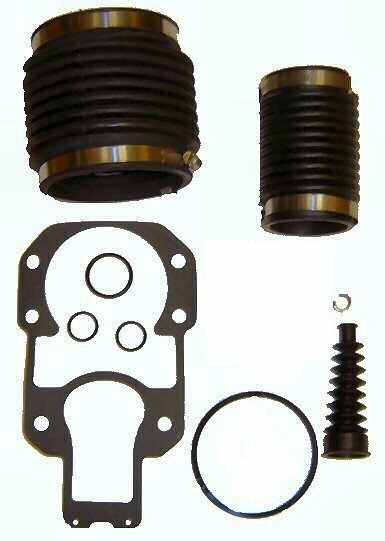 Bellows Kit for Mercruiser #1, R, MR or Alpha One Outdrive. This comprehensive kit for MerCruiser R, MR, 1 or Alpha One Drives from 1973-1990 (serial no. 's 3472478 and up). It is similar to 30-803097T1 except it does not include the bearing. This kit is a special kit for those customers servicing a drive without replacing the gimbal bearing. f your drive is 1972 or earlier or you are unsure what drive you have, check inside the U-joint bellows at each end. If there is a little "bump" inside each end, this kit will work perfectly. If it is completely smooth, just contact us before purchasing and we can likely swap out a u-joint bellows for you that will fit your drive!